iVision is a system which enables Automation of various Visual Inspections such as product Damage, Dirt, Dent, Warpage, Defect, Chip, Dimension, Color Inspections and Characters and Bar-code Reading. By Image-Processing technique, it Automates Visual Inspection, Dimensional Measurements Inspection, Color Inspection, and Bar-code/QR code Reading for products. This system registers an image of good product as a judgment reference image. And the system takes an image of inspection object with camera and inspects the appearance of product for a scratch or a dirt etc by comparing those images. In an inspection which is performed with human eyes, inspector’s skills and health condition greatly affect an accuracy of inspection. And there are risks such as quality dispersion of an inspection object and oversight of a defective product. Therefore, we developed a visual inspection system incorporating an image processing technology. You can avoid an human error and get a stable test accuracy and a high cost performance by using iVsion. In addition, we restrain system cost and shorten installation period by packaging basic functions. Of course you can add an inspection function optionally as required. Is it your first time to introduce a Visual Inspection System which uses machine? There is nothing to worry about. We provide a simple operation screen so that even beginners can use comfortably. 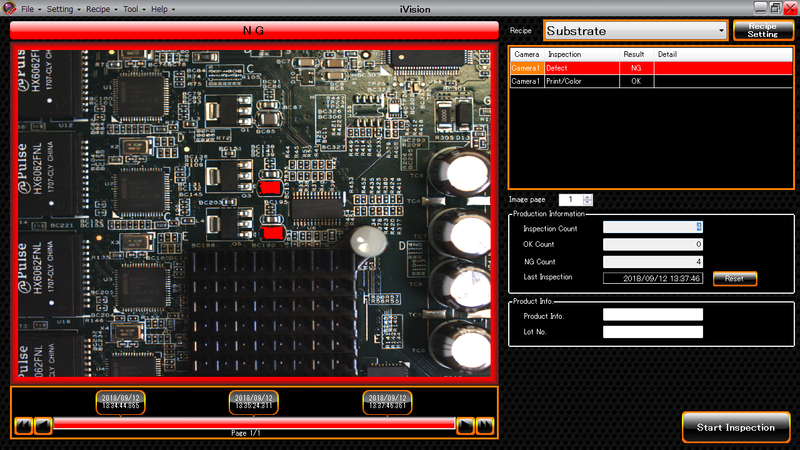 If you use iVision, a stabilization of high accuracy inspection like a skilled inspector level can be realized. ©Copyright 2019 AdD Co.,Ltd. All Rights Reserved.